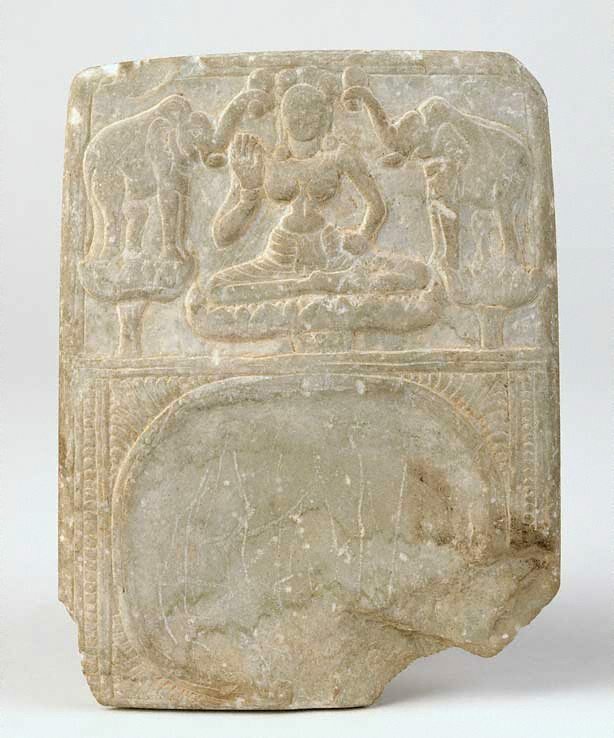 This marble cosmetic tray is ornamented with an image of the Hindu goddess Lakshmi, seated on a lotus with elephants to either side. Here, Lakshmi is depicted as the embodiment of loveliness, grace and charm. The sensuousness of this full-breasted, wasp-waisted Lakshmi relates to her function as the goddess of fertility, abundance and opulence. The presence of elephants washing her, enhance the overall sense of exuberance and luxury. This image iconographically, is known as 'Gajalakshmi', and is regarded as a highly auspicious emblem. It features above the entrances and doorways of temples and houses alike.